In systems where an Operating System is present the address space for the heap and the stack can be dynamically changed (managed). This is in contrast to the small embedded systems where the address space for both the heap and the stack is known at compilation time. 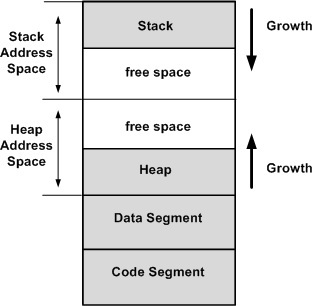 A distinction should be made between the dedicated address space and the current segment size of both the heap and the stack. The current segment size of both is dynamically changing (grows or shrinks) during program execution. A common misconception is that that the heap grows upwards (starting after the data segment) and the stack grows downwards. These are platform/architecture dependent specifics. The C language for example does not specify the minimum size or the location of the heap and the stack in the memory. The heap is a segment of the system memory (RAM) that provides dynamic memory allocation. Allocation failures, when a too big buffer is requested to be allocated.